Frame, structure, and enhance your eyebrows with this multifunctional conditioning smudge proof eyebrow pencil. Attached brow brush expertly shapes brows while the precision tip provides ultimate control for filling and defining. This light yet pigment-packed, blendable formula will compliment any hair colour or skin tone, while delivering smudgeproof all-day hold. For even more perfectly shaped eyebrows, use our Micro Trimmer to trim and shape eyebrows with extreme precision. Twist half a turn, only exposing tip slightly. 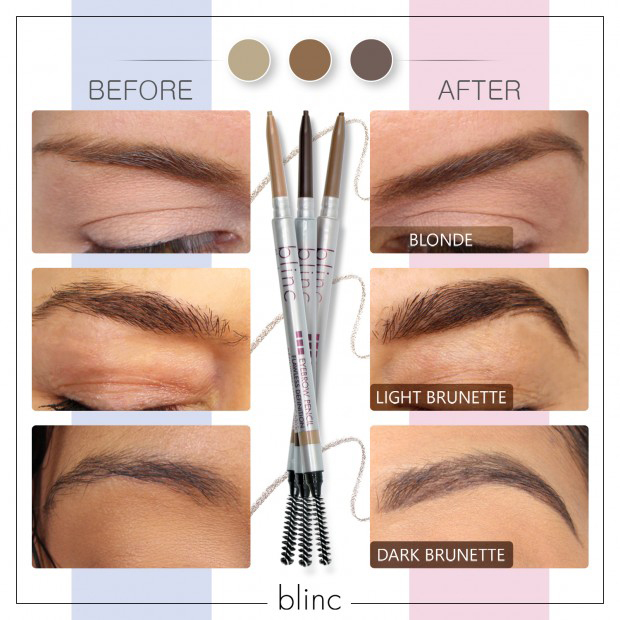 Define the brow shape by penciling along with light feather strokes. Fill in and shape for a perfectly defined brow. Then, use the brow brush to blend or gently brush through the brow hairs to sweep them into place giving you a natural, polished look. Can I use the brow mousse and brow pencil together? The universal brow pencil can be used alone or with the eyebrow mousse if you’re looking for a little extra hold to tame those unruly brow hairs. We recommend using the clear eyebrow mousse with this smudge proof eyebrow pencil. Is the pencil better for some people while mousse better for others? If so what determines this? OR should everyone have both in their makeup bags? Its all personal preference for the look of the brow, we recommend that everyone has both. Click the button below to add the Eyebrow Pencil - Light Brunette to your wish list.